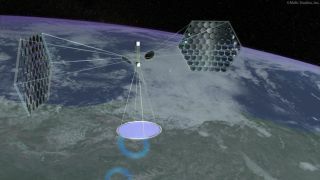 An artist's illustration by Mafic Studios, Inc. of a solar power satellite in Earth orbit. This story was updated at 3:13 p.m. EDT. WASHINGTON— A former NASA scientist has used radio waves to transmit solar power adistance of 92 miles (148 km) between two Hawaiian islands, an achievement thathe says proves the technology exists to beam solar power from satellites backto Earth. JohnC. Mankins demonstrated the solarpower transmission for the Discovery Channel, which paid for the four monthexperiment and will broadcast the results Friday at 9 p.m. EDT. His vision isto transmit solar power collected by orbiting satellites as large as 1,102 pounds (500 kg) to lake-sized receiver stations on Earth. Mankins,who worked at NASA for 25 years and managed the agency's space-based solarprogram before it was disbanded, transmitted 20 watts of power between the twoislands in May. The receivers, however, were so small that less than oneone-thousandth of a percent of the power was received, Mankins said. Theexperiment cost about $1 million, and Mankins said largerarrays could be constructed with more money. Eachof the nine solar panels used was built to transmit about 20 watts of power,but the transmission was scaled back to two watts per panel in order to obtainU.S. Federal Aviation Administration approval for the test. Despitethe miniscule reception on the receiving end, Mankins said the ground-basedtest proved it is possible to transmit solar power through the atmosphere. "Thetest was in no way fully successful," he said. "I think it showed itis possible to transmit solar power quickly and affordably." The Discovery Channel will highlight the solar power beamingexperiment Friday, Sept. 12 in ?Discovery Project Earth: Orbital Power Plant.? ?Checklocal listings.